New Restylane Silk Product is great for Lines around the Mouth and subtle lip enhancement. Restylane Silk is a new FDA-approved hyaluraonic acid product for correcting the fine lines around the mouth and subtly enhancing the lips. 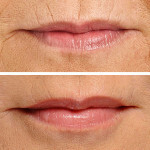 As we age the lips and the lines around the mouth can start to show their age just like the other areas of the face. Most of the time this is seen as loss of lip volume, loss of lip shape, and the increase of lines around the mouth. Restylane® Silk is an injectable that is gently injected under the skin to restore volume to the area. This results in smoothing lines and wrinkles as well as plumping lips. What makes Restylane Silk different than other cosmetic fillers? Now with the New Restylane Silk, superficial lines can be plumped up more naturally with subtle results. This product is formulated using smaller, smoother particles than those used in other Restylane® products. As a result, this smooth refined gel formula allows for more precise sculpting of the lips and correction of superficial lines. Patients injected with Restylane Silk can see results that can last up to 9 months. Call our office to schedule a consultation today!